So apparently we’re now well into Phase 2 in the building of the Marvel Cinematic Universe. The second phase began strongly last summer with IRON MAN 3, continued with the lackluster THOR: THE DARK WORLD, and now hits its highest point with CAPTAIN AMERICA: THE WINTER SOLDIER, a sequel which surpasses the 2011 original (CAPTAIN AMERICA: THE FIRST AVENGER). The iconic comic book character’s latest adventure is now in the hands of Anthony and Joe Russo, who are better known for their television work (Arrested Development, Community) than their film output (WELCOME TO COLINWOOD, YOU, ME & DUPREE). Working from a screenplay by Christopher Markus and Stephen McFeely, who wrote the first installment, the Russo brothers confidently take control with a soaring action film that actually has a compelling politically driven plot-line. Chris Evans dons the red, white, and blue uniform and shield for his third appearance as the iconic super hero (fourth if you count his cameo in the THOR sequel last year) in this adventure that is set two years after the events of THE AVENGERS. We catch up with Evan’s Steve Rogers/Captain America working for S.H.I.E.LD. in Washington D.C. and trying to catch up with modern culture (he carries a notebook with a list of things he missed while he was in a cryogenic sleep state for 70 years that includes Moon Landing, Nirvana, Star Trek, Thai food, etc.). In a stunning opening involving taking on French/Algerian pirates with on a hijacked naval vessel, Captain America catches Black Widow (Scarlett Johansson) extracting electronic files from the ship’s computers, which disturbingly means S.H.I.E.L.D. Commander Nick Fury (Samuel L. Jackson) had an ulterior motive for the mission. Back at S.H.I.E.L.D. headquarters, Fury debriefs Captain America about Project: Insight, which will send into space three huge “Helicarriers,” that are linked to spy satellites and have the capabilities to preemptively take out potential threats. The project has been spearheaded by a cold calculating Robert Redford as World Security head Alexander Pierce, who it’s no Spoiler to say turns out to be the central villain – an agent of HYDRA, the terrorist organization Captain America fought in the first film. An incredibly jolting car-chase sequence through the streets of D.C. ends with Fury being gunned down by a shadowy assassin, the Winter Soldier, whose face we can’t see. With Fury presumed dead to the world, our hero is left to protect the film’s MacGuffin, the USB flash drive that contains the encrypted data Johansson previously retrieved. The ins and outs of the plot get a bit too complicated from here, but with its ginormous set piece scenes of explosive destruction (the mammoth annihilation of Tony Stark’s Malibu fortress in IRON MAN 3 has nothing on the climatic CGI spectacle here), you won’t care about keeping up with the twists. As Captain America, Evans contributes a sharp stoically charming portrayal, one in which statuesque stiffness is a requirement of the job. 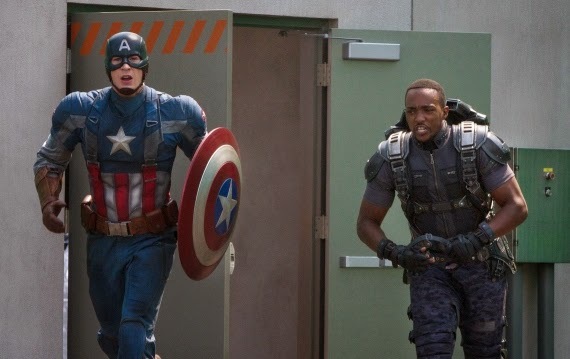 Evans’ banter with Johansson is fun to watch, but his easy-going chemistry with charismatic newcomer Anthony Mackie as Sam Wilson/Falcon (an old Marvel character making its first appearance in the franchise), is where his performance pops. The film is enhanced by expanded roles for Jackson and Johansson, and Frank Grillo as a HYDRA henchman is an effective baddie (another Spoiler? ), but Redford, probably ecstatic to have so much exposition after ALL IS LOST, is the real scene stealer. His part obviously pays homage to his role in Sydney Pollack’s 1975 political thriller THREE DAYS OF THE CONDOR, as does the movie’s dark themes of techno-paranoia, updated for our current climate. It’s a testament to Markus and McFeely’s tight screenplay that these themes are crucial to the narrative and aren’t treated as background fodder. Its layered depth helps it transcend the standard super hero storyline structure, while still holding on the fun we’ve come to expect from the formula (on-the-nose one-liners, cross references, Stan Lee cameo, etc.). CAPTAIN AMERICA: THE WINTER SOLDIER is one of the best Marvel movies, with just the right amount of humor, thrills, and clever character interaction to keep both fans and casual movie-goers highly invested, right through to the signature stinger at the end of the credits.